Martha Haftel was born in Vienna, 25 September 1922. Died, October 6, 1985, Jamestown, NY. Singer, pianist and actress. Martha was the only daughter of Meier and Gisa Braten Haftel, who were Orthodox Jews. Her father owned a kosher restaurant in Vienna, where Martha spent her formative years before escaping Nazis in 1938. She escaped through France to England, where her father became a butler and her mother a cook. She attended a Jewish school in England. Despite being refugees, her parents were considered “enemy aliens” and so were interned by the English government on the Isle of Man . Martha chose to join her parents there. At the camp she met Engel Lund, a singer from Iceland, who inspired her to become an international singer. He recommended her to good music teachers, and after WWII, she studied with Ferdinand Rauter (piano) and Emmy Heim (voice) in London. Schlamme came to the US in 1948, shortly after marrying Hans Schlamme, which marriage ended in annulment in the 1960s. She began her concert career in the Catskills singing in Hebrew and Yiddish. She continued vocal studies with Marinka Gurewich and Hans Heinz and later at Aspen where she studied with Jennie Tourel, who introduced her to Olga Ryss who became her coach. She began singing at good venues including college campuses, concert halls and nightclubs, such as Town Hall and the Village Gate in NY and Wilshire-Ebell Theater in LA. She was able to perform on tv and radio. She was so popular that by 1960, she had performed at over a thousand concerts in the US. Shlamme was known as a supreme interpreter of folk song and concertized and recorded in twelve languages, saying to The Christian Science Monitor in 1959 “The real test of a multilinguist is whether he can make his audience feel a part of the country about which he is singing” and commenting again in Musical America in 1963, “The meaning-yes, that’s the most important thing!” Schlamme enthusiastically sang Jewish songs throughout her career. On the Vanguard, Folkways, Columbia and MGM labels she produced fifteen albums including “Martha Schlamme Sings Israeli Folk Songs”(1953); “Martha Schlamme Sings Folk Songs of Many Lands” (1958); “Martha Schlamme Sings Jewish Folks Songs”(1957, and vol. 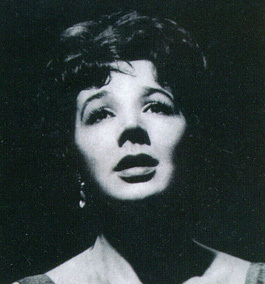 2 1959). She recorded “German Folk Songs” on the Folkways label with Pete Seeger. As an early performer of Kurt Weill songs, her roles brought her considerable attention and fame. She performed Weill’s songs in Edinburgh at a venue called the Howff. This show grew and eventually came to New York, playing for months. For over twenty years she included Weill’s music in her programs and produced the recordings “The World of Kurt Weill in Song” (1962) and “A Kurt Weill Cabaret” (1963). In 1965, she starred in a production of Weill’s “Mahoganny” at the Strafford Festival in Ontario and two years later sang at Ravinia Music Festival in “A Kurt Weill Cabaret” with Alvin Epstein. In 1985, she appeared with Epstein at the Israel Festival in Jerusalem. Schlamme sang on Broadway, playing the role of Golde in “Fiddler on the Roof” in 1968, and that same year appearing in “A Month of Sundays”, and “Solitaire, Double Solitaire.” Later she had a one-woman show, “A Woman Without a Man is…” Schlamme became a teacher of song and acting at the the Circle in the Square Theater School in New York and H.B. Studio. Schlamme was close to activists in leftist politics and later married Mark Lane, a Democratic politician. Despite her early personal experiences, Ms. Schlamme wrote in a Music Journal article in May, 1963, “I have always felt that people are very much alike all over the world; by that I mean the human experience is very similar…. Languages differ, customs differ, and the variations are fascinating but not incomprehensible. And the same holds true for the music of different peoples.” Martha Schlamme suffered a stroke onstage at the Chautaugqua in front of an audience of three thousand. She died at age sixty in nearby Jamestown, NY. Today, her Yiddish and Weill recordings still circulate as reformatted CDs.